Caribbeana contains many references to Wharton family. 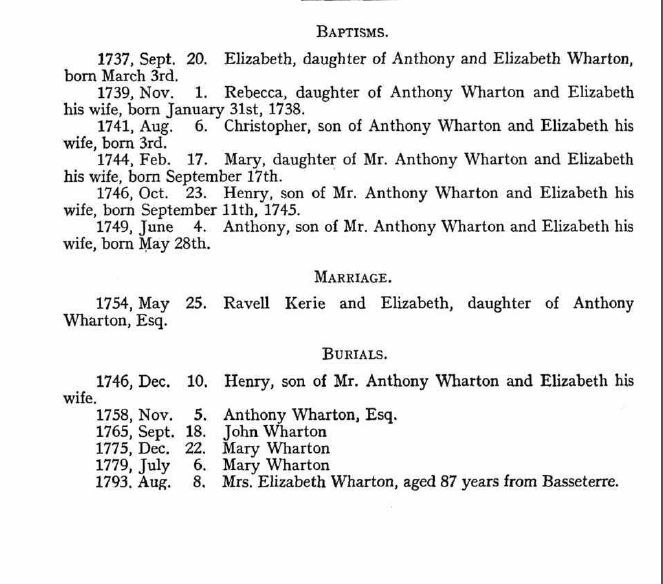 Anthony Wharton, Esq., of St Christopher, was named in 1755 as an executor in the Will of Richard Wilson, but was dead in July 1759. Ref: Caribbeana Vol 1 Page 78. In the 57th Year of His Age. By Elizabeth his wife he had two sons Aretas died 1806. Will (179 Pitt) and Anthony and three daughters Rebecca married 1759 Capt James Young, Mary married John Julius, and Elizabeth married Ravel Kerie. See his bookplate number 701. See Caribbeana 1, 78 4th William Wharton.